Good morning. 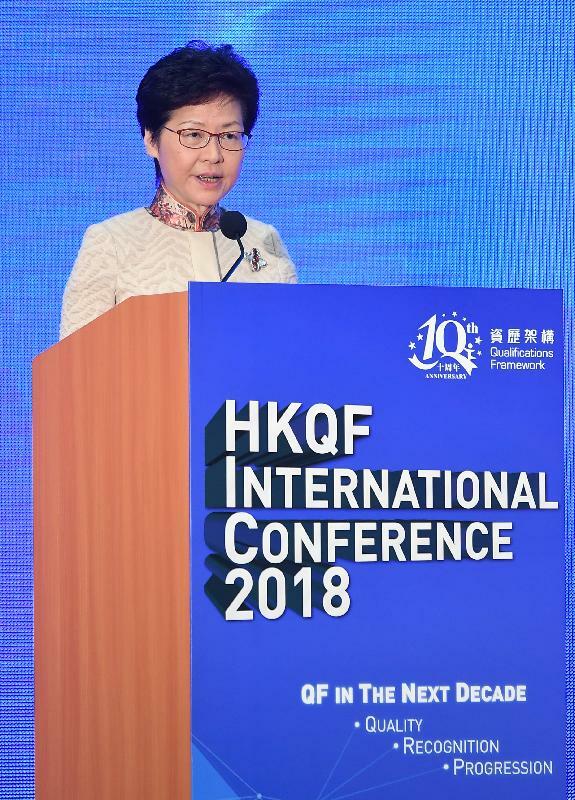 It gives me great pleasure to be here today for the Hong Kong Qualifications Framework International Conference, and to speak to such a distinguished audience of qualifications' framework authorities, especially those coming from overseas, vocational and professional education and training specialists, academics, industry practitioners and business leaders. As the Chief Executive of the Hong Kong Special Administrative Region, I have to say that I am proud of the fact that we could continue to meet here. It's a clear indication of the robustness of our city management, noting that it was only some 12 hours ago that we were hit by a super typhoon. This Conference marks the proud 10th anniversary of our Qualifications Framework (QF). We have come a long way here in Hong Kong, with the acronym QF now being recognised by many people, but I hope today's Conference will point us the way forward in a rapidly changing environment. Looking back, our goal has not changed since we established the Hong Kong Qualifications Framework in 2008, which is to upgrade the quality of our human capital. At that time, we had a proliferation of qualifications, but they lacked clear and common benchmarks in terms of quality and progression. What we needed was a transparent and credible qualifications system, one in which learners enjoy easy access to information about the standard and quality of education and training programmes, and the qualifications those programmes would lead to. We also needed a platform for industries, learners and service providers to work together, to ensure that our education and training programmes were relevant and responsive to our manpower and community needs. I'm pleased to say that, thanks to the concerted efforts of industries, professional bodies, labour and our training providers, we've created a Qualifications Framework, which has become the common benchmarks for quality assurance in 23 industries over this past decade. Legislative amendments have also been made to ensure that the Hong Kong Council for Accreditation of Academic and Vocational Qualifications, our accreditation authority, operates with transparency and quality assurance. The Hong Kong Qualifications Framework is now a credible qualifications system in the academic, vocational, professional and continuing education sectors, and is widely implemented in recruitment, training and promotion by companies from a wide range of businesses. Educational institutions, professional bodies and the labour sector have also embraced it, designing programmes accredited under the Qualifications Framework, while encouraging learners to seek those qualifications. Even training schools within the civil service such as the Police College, the Immigration Service Institute of Training & Development, the Correctional Services Department Staff Training Institute and the Civil Aid Service Training School have adjusted or developed in-house programmes to align with the QF giving trainees better recognition and opportunities for further advancement. We are also enhancing our profile internationally, gaining recognition of our qualifications by our overseas counterparts. With the support of our overseas partners including some of you here today, we have completed four comparability studies with the qualifications' framework of the European Union, Scotland, Ireland and New Zealand. The studies demonstrate the high standards of our Framework and quality assurance system, boosting their credibility and recognition world-wide. It now stands as a solid foundation in Hong Kong's progressive development as a knowledge-based economy. The theme of today's Conference – "QF in the Next Decade: Quality, Progression and Recognition" – spotlights the mission of my Government in respect of education: to continually improve the quality of our education system, to drive progress and to promote recognition for our students and learners. Education and training lie at the heart of Hong Kong's progress, and are essential to the long-term planning of our social and economic development. My vision is to improve our quality of education, to create a stable, caring, inspiring, high-quality learning environment for our younger generation. I'm determined that they have everything they need to explore their potential, to cultivate their interests and to find their future. I regard spending on Education as the most meaningful investment for our future development. Therefore, in my first week as the Chief Executive a year ago in July, I announced an immediate increase in Hong Kong's recurrent education expenditure of HK$3.6 billion, covering the spectrum of our educational system, from kindergarten and special education to post-secondary education. In our 2018-19 financial year, total government expenditure on education is projected to reach a historic high of HK$113 billion, an increase of 28 per cent over the previous year and accounting for one-fifth of Hong Kong's total government expenditure. We are prepared to further invest, as we have earmarked another HK$3.4 billion recurrent expenditure for education, and we are engaging professional experts through various task forces to come up with the best recommendations in consultation with our education stakeholders. As for the QF, we are injecting HK$1.2 billion into the QF Fund. The money will strengthen its development, enhance recognition of qualifications for various industries and provide our youth with quality-assured pathways for further studies and career development. I am confident that the Hong Kong Qualifications Framework will continue to play its part in equipping our youth with the knowledge and skills to realise their potential, and keeping Hong Kong's competitive in this fast-changing world. My thanks to the Education Bureau and the Qualifications Framework Secretariat for organising this Conference. 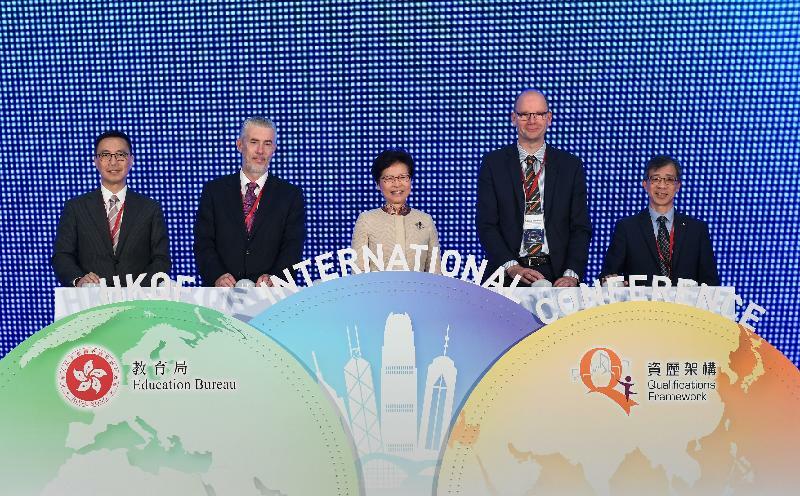 My thanks as well to the Hong Kong Council for Accreditation of Academic and Vocational Qualifications, and to our supporting organisations: the European Commission, the New Zealand Qualifications Authority, Quality and Qualifications Ireland, and the Scottish Credit and Qualifications Framework Partnership. I wish you all a very rewarding Conference. Thank you very much.